With so many flooring choices, how do you pick the best natural stone flooring for your home or commercial building? Discover what you need to know about choosing natural stone for floors. This is an old test of time. If you wanted temporary flooring, you'd go with carpet, but not even all stone flooring choices are equal. Everything that we use in modern flooring - slate, marble, travertine, and granite - all wear with too-high foot traffic. That makes the real decision more about restoration. To keep the value of your home or commercial building high, the restoration capability of natural stone flooring is a top consideration. Slate is beautiful, but its beauty comes from the uneven nature. Refinishing and restoration can ruin that. 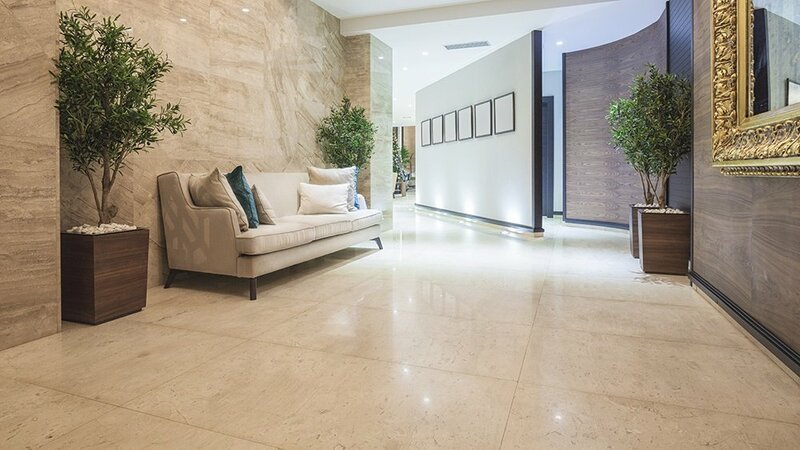 Marble is dense and hard, which means it stands up to high foot traffic. Its hardness makes it easier to refinish over most other natural stones. Granite is hard like marble and stands up to high foot traffic, but installation cost is typically more expensive than marble. Granite is also porous, which means it needs to be sealed often and can stain deeply. Natural stone floors add value to your home or commercial building more than other flooring choices. Carpet and laminate have life cycles that are measured in years, while stone flooring last millennia. Natural stone should be easier to restore. It should stand up to traffic and wear. Natural stone should resurface beautifully and nearly without notice. It should be recognized for its natural beauty. Natural stone should add to a room. It should be noticeable by property owners and guests. Of all the natural stone choices, only marble ticks off all of those boxes. Natural stone flooring comes in a variety of colors, from nearly pure white to rich, deep black. Another consideration is the size of the mined stones. Travertine, for example, is cut from stalagmites, so larger slabs aren’t possible. Contrast that with marble and granite, which come in very large slabs. Colors and patterns are one thing, but the stones that offer a translucence are king. Hard, dense stones take a polish or finish and restore better. Granite and marble are both capable of polishing to a high shine. Softer stones polish, but restoring that polish is a costly hassle. Not all natural stones are forgiving in staining. What happens if a child uses a permanent marker on the floor? How do animal paws and claws handle natural stone flooring? Flooring isn’t only about what looks pretty. It's about how it’s going to stand the test of time, especially with a high risk for staining. Some stones are more difficult to refinish and repair, and it's less expensive to replace a stone floor than to repair it. Others, like marble, are easier to restore if a marble restoration company understands the marble restoration process from start to finish. It’s a cost-versus-value consideration that shouldn’t be taken lightly. All natural stones have a weakness. Travertine is soft, granite is porous and can stain, slate is difficult to resurface, and marble can become brittle. While every type of stone has a minor disadvantage, most offer nearly flawless flooring options. Understand the disadvantages of all natural stone choices before you buy. How will the natural stone floor respond in a decade?